Back in June, I was extended an offer from PACKT Publishing to review a new VMware book. I’ve got a lot on my plate at the moment but it sounded like an easier read and I appreciated the offer as well as the accommodation of my request for paperback in lieu of electronic copy so I accepted. I finished reading it this past weekend. The book’s title is VMware vCenter Cookbook and it is PACKT’s latest addition to an already extensive Cookbook series (Interested in Docker, DevOps, or Data Science? There’s Cookbooks for that). Although it was first published in May 2015, the content isn’t quite so new as its coverage includes vSphere 5, and vSphere 5 only with specific focus on vSphere management via vCenter Server as the title of the book indicates. The author is Konstantin Kuminsky and as I mentioned earlier the book is made available in both Kindle and paperback formats. 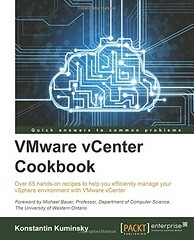 Admittedly I’m not familiar with PACKT’s other Cookbooks but the formula for this one is much the same as the others I imagine: “Over 65 hands-on recipes to help you efficiently manage your vSphere environment with VMware vCenter”. Each of the recipes ties to a management task that an Administrator of a vSphere environment might need to carry out day to day, weekly, monthly, or perhaps annually. Some of the recipes can also be associated with and aid in design, architecture, and planning although I would not say these are not the main areas of focus. The majority of the text is operational in nature. The recipes are organized by chapter and while going from one to the next, there may be a correlation, but often there is not. It should be clear at this point it reads like a cookbook, and not a mystery novel (although for review purposes I did read it cover to cover). Find the vCenter how-to recipe you need via the Table of Contents or the index and follow it. Expect no more and no less. It’s a desktop reference (or handheld I suppose depending on your preferred consumption model) which walks you through vSphere packaging and licensing on one page, and NUMA architecture on the next. The focus is vCenter Server and perhaps more accurately vSphere management. Fortunately that means there is quite a bit of ESXi coverage as well with management inroads from vCenter, PowerShell, and esxcli. Both Windows and appliance vCenter Server editions are included as well as equally fair coverage of both vSphere legacy client and vSphere web client. Bottom line: It’s a good book but it would have been better had it been released at least a year or two earlier. Without vSphere 6 coverage, there’s not a lot of mileage left on the odometer. In fairness I will state that many of the recipes will translate identically or closely to vSphere 6, but not all of them. To provide a few examples, VM templates and their best operational practices haven’t changed that much. On the other hand, there are significant differences between FT capabilities and limitations between vSphere 5 and vSphere 6. From a technical perspective, I found it pretty spot on which means the author and/or the reviewers did a fine job. Thank you PACKT Publishing for the book and the opportunity. You are currently browsing the archives for July, 2015.